Even though we are getting warmer weather now, there are still some grey, chilly (but not really cold) days here–the kind of day where you want to smell fresh-baked bread or something warm and filling cooking in the kitchen. Even though pot roast is something that reheats well, and freezes well when you make it, I don’t always want a huge batch so I was thinking about alternatives to the usual chuck roast. 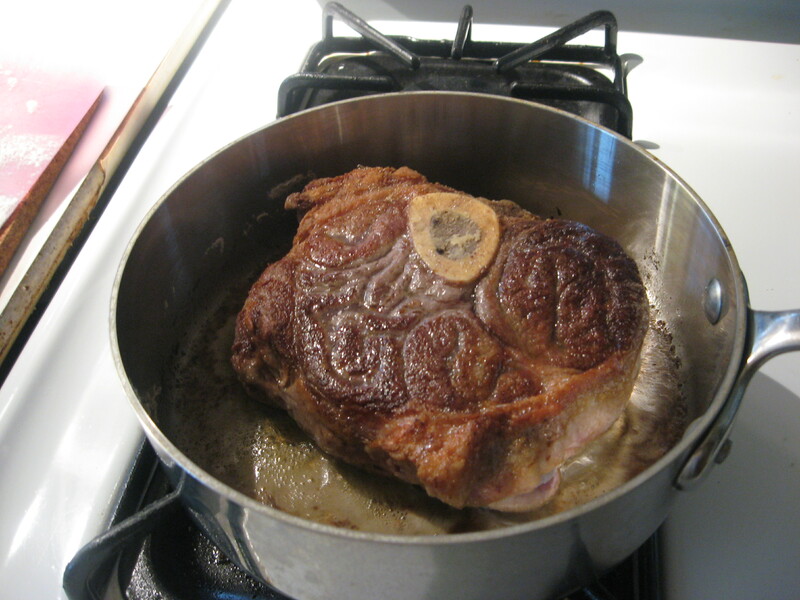 Today it’s somewhere between ersatz osso buco and pot roast. I love pot roast, but starting with a huge (for single-serving cooking, at least) chuck roast is just a bit much when you don’t want to stock the freezer for future meals. 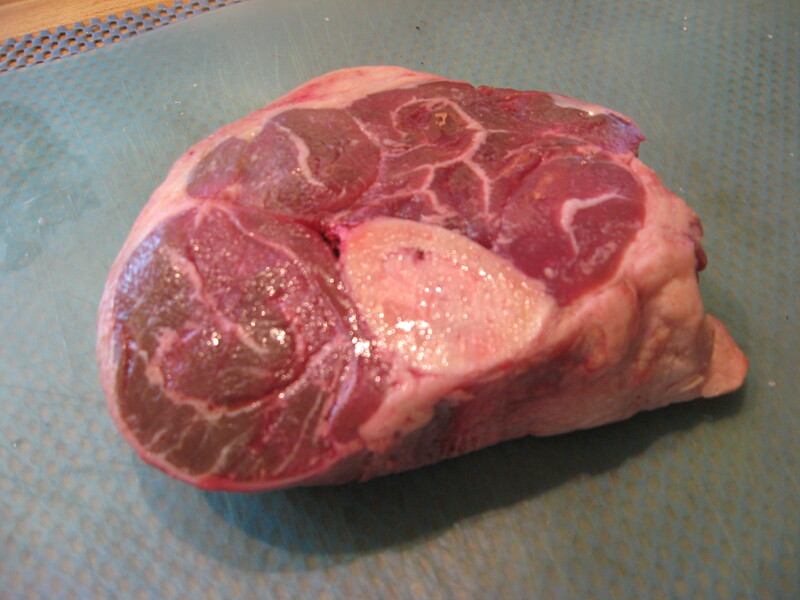 I decided that a cut of beef shank would make a great alternative to the chuck roast; just have it cut a bit thicker, and the marrow bone is another benefit. Since I had this cow shank, I obviously thought of osso buco, though it’s true that real thing is would be made with veal shanks. Veal shanks (and lamb shanks) are actually too pricey for my budget most of the time–I watch closely for managers’ specials in the butcher case. (Note that this is in a pan of the appropriate size–not too big, not too small. There’s no plastic so this can go into the oven for a nice low and slow cooking, covered with its tight-fitting lid. 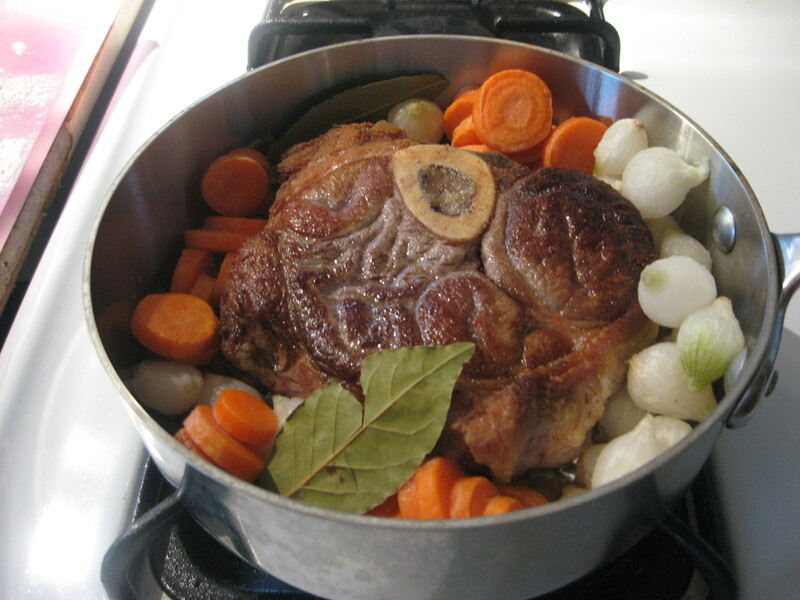 Once the shank was nicely browned, there not really much to do except tuck some carrots, onions, and bay leaves around the edges, a pinch of salt, add some dry white wine, and some beef stock–just poured it in until it was about 1/3 of the way up the side of the meat. That’s the reason it’s important to have an appropriate size pot–too large and you have to add too much liquid. We’re not wanting to make soup here. Thanks! I hope it works for you. For me, the biggest item in paring it down to size for one was the size of the cut of meat that I was dealing. I have no idea why it took me so long to figure out that a shank would be beefy, and tender with long braising. I had to see one lying in the butcher case before it dawned on me that this would work–and I’d have the added benefit of a lovely marrow bone to enjoy. BTW, I had more of the cabbage casserole (from the freezer). It freezes well. Bookmarking this one! I love pot roast but shy away from making it because I’ve yet to successfully pare the recipe down to one. Thank you!